A week after Matt Fryatt lost his Cash Converters patch against Brighton, there has been another sponsor malfunction in a City match. This time it affected Jay Simpson, who started up front for the reserves in their game against Hartlepool’s second string at North Ferriby’s Church Road (Calling it the Rapid Solicitors Stadium feels very, very wrong) on Wednesday. We asked if Simpson was wearing Fryatt’s shirt, figuring it could have been ‘recycled’ and used for reserve games, but kitman John Eyre tells us this was an all new sponsor malfunction. 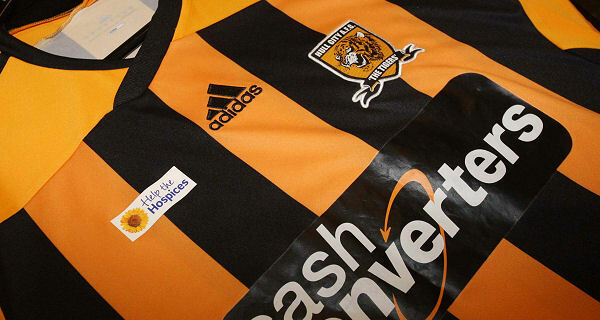 We wonder if any Tiger Nationals have been tempted to boil wash their replica home shirts in a bid to possess a patch free, though partially shiny fronted shirt like Fryatt and Simpson. 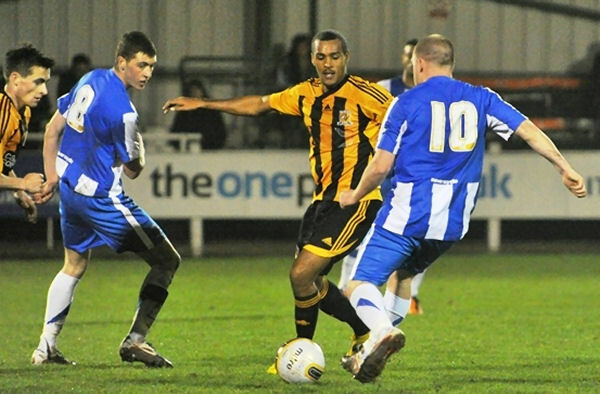 One of our Twitter followers, @hullrico, told us of a sponsor malfuntion on Robert Koren’s shorts last season. We had a look through some images from 2010/11 and he was dead right. Over the course of several games, the heat bonded logo of SLS on Koren’s shorts degraded, as evidenced by the photo of the Slovenian playing against Crystal Palace late last season. 2010/11 is the only season we’ve had short sponsors, for 2011/12, SLS ‘upgraded’ their financial backing to become back of shirt sponsors. 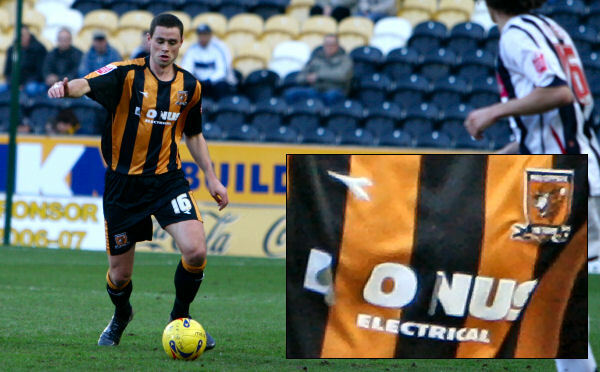 Matty Fryatt’s shirt losing its Cash Converters patch during the Brighton game this week had us wondering about other shirt sponsor malfunctions, so we had a check through the photo archives. 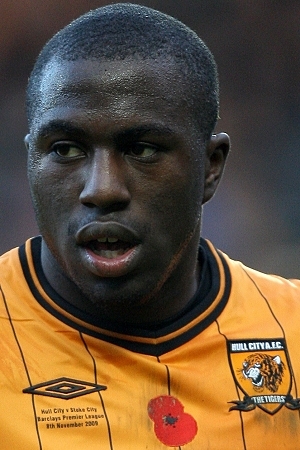 The last instance we could find was in the 2006/07 Championship match between City and West Brom at the KC Stadium. In that game, a 1-0 defeat, the letters B, O and N from the BONUS ELECTRICAL appliqué on Damien Delaney’s shirt began to peel away. Let us know if you’re aware of other instances of sponsor malfunction. Matt Fryatt’s kit looked great for much of the goalless draw with Brighton at the KC Stadium tonight, as a sponsor patch malfunction aesthetically improved his shirt no end. He took to the pitch sans-Cash Converters logo for the second half, the shirt-blighting black patch had completely detached, leaving only a shiny band where the appliqué had been heat bonded on. 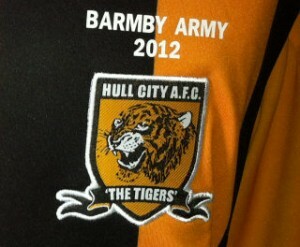 If the club put this shirt on Ebay, we’re bidding for it! Arsenal midfielder Jack Wilshere, commenting at the height of this week’s manufactured outrage regarding poppies on the England shirts used the word ‘tradition’, as if a poppy appliqué has always enhanced the national team’s garb in games played close to Remembrance Sunday. While the wearing of remembrance poppies to commemorate lost servicemen dates back to 1920 (and contrary to EDL thinking is not a uniquely English or British custom, the practice originated in the United States), the addition of the poppy motif to the playing kits of footballers is a distinctly modern exercise, and they have never appeared on England kits before this year. Even at club level the convention is only several years old, and City didn’t join in till 2009, when they played a game on Remembrance Sunday. Since then though, it has become a yearly occurrence. 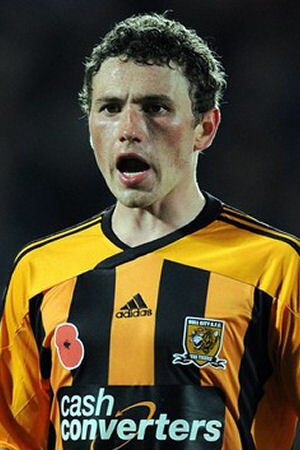 On November 8th 2009, the Tigers hosted Stoke in a Premier League encounter at the KC Stadium, a game marked with a respectful silence before kick off. In the run up to the game, the club announced that the players would wear shirts bearing poppy appliqués and embroidery, and that these shirts would later be auctioned with monies raised going to the Royal British Legion. The poppies were placed centrally, underneath the shirt’s V-neck collar. Text under Umbro’s diamond logo read HULL CITY v STOKE CITY, BARCLAYS PREMIER LEAGUE, 8th NOVEMBER 2009. After the 2-1 win, an Ebay auction raised £8784.08. The following year slightly larger heat bonded transfers were used (these not embellished by embroidered text), and the position of the poppies moved from centre to the right breast (as worn) opposite the club crest, as the manufacturers mark was placed on the shoulder of the 2010/2011 shirt. These shirts were used at Preston North End in the Sky Sports televised Championship game on Friday, November 11th 2010, a 2-0 win in which we wore white shorts and socks with the home shirt to avoid a colour clash. In 2011, because an international break included the weekend of Remembrance Sunday, the poppies were used the week before on Saturday, November 5th, the day of Guy Fawkes’ Night. City faced West Ham at home and used the same size appliqués as 2010, with the poppies again appearing on the right breast, opposite the club crest and below the adidas logo. A silence was observed, and crew of the HMS Iron Duke (a Duke class Royal Navy frigate affiliated to Hull) delivered the match ball and laid wreaths before the game on behalf of the three armed forces.